One of the easy care perennial plants for the border Coreopsis are a wildflower from Florida and nearby areas. Flowering in late summer this bright and lively plants include C. verticillata and C. grandiflora with the former being a more refined plant with fine foliage. In a good soil they need very little care, however in long dry summer periods some extra water may be required. 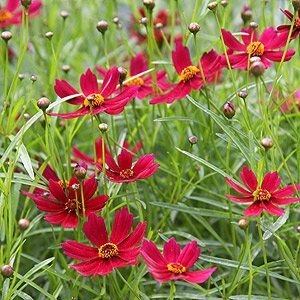 Taller growing than ‘Limerock Ruby’, Coreopsis grandiflora ‘Sweet Dreams’ with its whit tipped raspberry red petals will reach nearly 70cm in height. Long flowering and with the tall growth habit the flowers will move gently in the wind. Golden centre like most varieties adds a little contrast. Over time it will form a neat clump which can be easily divided in early spring. 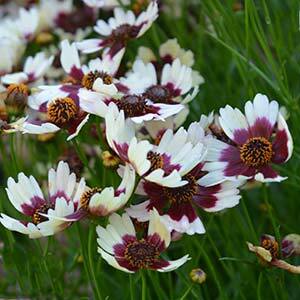 This colourful two tone pink to white and red variety is a cultivar of Coreopsis verticillata. Lower growing than sone to around 40cm this is long flowering and easily pruned to maintain shape. A humus rich moist soil and a sunny position will see most varieties’ thrive. Well drained soil is essential, however moisture during the growing season is required. After the first flush of flowers the plant can be clipped back with some garden shears to encourage a better second flush of flowers. This can be repeated.